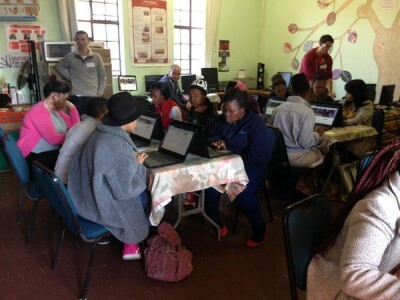 This Saturday past, 28th June, myself and a bunch of volunteers headed out to Brothers For All in Langa to run another Webmaker event. 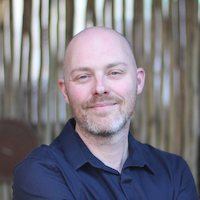 Thank you Gavin, Andrew, De Wet, Jeremy, Simon, Trevor, and Nathan for all your hard work, and a huge thank you to Sihle (@sihletshaba on Twitter) of Brothers For All @brothersforall on Twitter for hosting us. We ran this event with a very similar agenda to our previous one. The internet at Brothers For All is blazing fast, which helped a lot. On top of that, our students were really great. They blazed through the course and helped each other out a lot: they hardly needed us teachers! At the end of the course, Sihle treated us all to some proper Langa braai meat from a place around the corner. It was delicious; thank you, Sihle! We used very similar activities to our previous webmaker event, again using some of the great ideas from Sharon Bowman’s Training From The Back Of The Room. 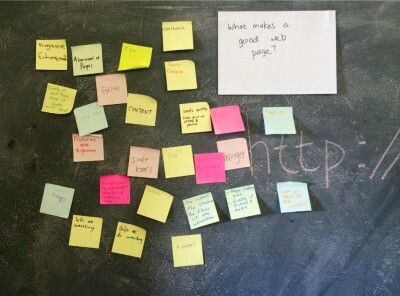 We started with “What makes a good web page?” Students placed stickies on the wall answering the question. After lunch we tried to have a few more move-around-do-stuff activities to get the blood rushing again after lunch. We started with “Take a stand.” We marked one side of the classroom as “Not so confident” and the other side as “Very confident,” and asked students to stand somewhere on the line that represented how they felt about the morning session. Then, we paired up students at the opposite ends of the scale, and gave them a few minutes to discuss what was good about the morning, and what was bad about it. 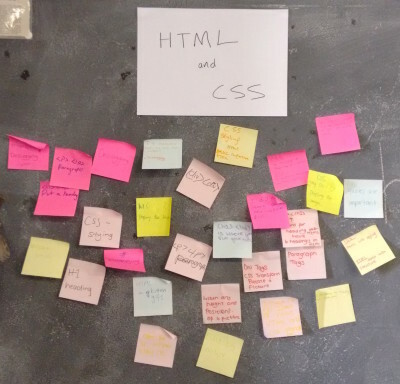 Then, we did a “beat the clock” activity: students had one minute to write down as many sticky notes as they could about HTML and CSS, based on the things they had learnt in the morning session. We closed the day with a reflection exercise. Students got one index card each, and were asked to write down what the most valuable thing they learned was. Then, they were asked to form groups of four or more and discuss their cards. The two weeks between the our two Webmaker event flew by, so we didn’t have time to make as many changes as we wanted to, or to have our teacher meeting to discuss the ups and downs of the previous one. At the moment, the next Webmaker event we have lined up is in September, so that gives us plenty of time to make some changes.